According to industry research, data degrades at 2.1% per month and every year 25-30% of data goes inaccurate. actionable to drive new business. This can negatively affect strategic decision-making and productivity across an entire foodservice organization including marketing, sales, finance and management. As a result, the regular use of incomplete and fragmented data increases operational costs resulting in ineffective lead-generation, and fewer new business opportunities. The level of data quality in a foodservice organization has a direct impact of operating costs and efficiencies. In turn, the consistent use of incomplete, inaccurate, or fragmented industry data results in higher sales-related costs and greater marketing program expenditures. For example, inferior data results in non-optimized business processes, poor market intelligence, lack of market analytics, disconnected customer awareness, wasted sales calls, and higher prospecting and marketing costs. Nonactionable information results in wrong operator addresses, wasted postage, lower response rates, and poor “street level” operator information. 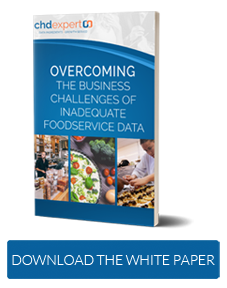 Without access to higher quality data, a foodservice organization cannot achieve their anticipated sales and marketing goals. Framework, which provides highly accurate foodservice industry market intelligence to foodservice providers of all sizes around the globe. CHD Expert meticulously collects, researches, segments and manages millions of data records and intelligence in order to provide its clients with the most detailed information possible for today’s fast changing foodservice industry. Monthly updates ensure the data reflects the most recent location opens, closes, and changes in ownership. With regularly updated and highly accurate information from the CHD Expert Solution Framework, foodservice providers can focus their sales and marketing resources on targeted prospects that will foster the best opportunities for business success. opportunities to enhance operational effectiveness, generate higher sales revenues, and increase bottom-line profitability.